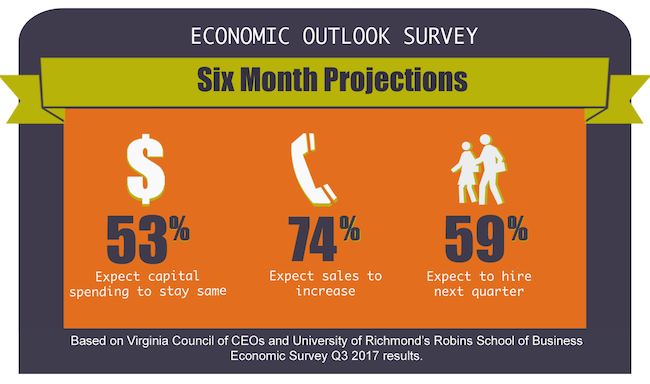 The third quarter 2017 CEO Economic Outlook survey finds that optimism among Virginia CEOs remains high, but falls from levels seen in the previous three quarters, which were the highest in the survey’s seven-year history. The survey’s index, which measures executives’ views on projected hiring, capital spending and sales over the next six months, was the sixth-highest ever. The three previous quarters (Q1 2017, Q4 2016, and Q2 2017), saw the index reach the highest marks in the survey’s history. The survey has been administered quarterly since 2010.
Business owners and CEOs who would like to participate in the next survey should contact Scot McRoberts, executive director, Virginia Council of CEOs.